Every once in a while, napaman leaves the Napa Valley homestead and wanders afield to find great food and wine elsewhere. As former food editor and restaurant critic of the Toronto Star, the third largest newspaper in North America, I was trained to keep looking for The Next Best New Dish, and The Next Best New Super Chef. Rarely was I able to return to a wonderful, familiar restaurant because so many new ones were crying out to be reviewed. Today, the luxury of not having a fixed newspaper deadline means that I can return to a restaurant as many times as I wish to indulge my senses. And I just returned to an earlier favorite, Café Rouge, in Berkeley. And the good news is that it is better than ever. Bill Niman Ranch beef meatballs, served in a stew of white corn and wilted collard greens, richly flavored with a complex salsa verde. There is no question that this is my favorite new dish of the year. If this were a wine I just discovered, I would go out and buy a case. Or two. I could never have too much. The meatballs are juicy, tender, golf-ball-shaped and sized, yet cut-able with a fork; the pale white corn has been freshly shucked off ears; the collard greens thread through the soupy strew like seaweed, adding texture, flavor and color. I spoke with the chef and, yes, I know intellectually that he has not added Zatarain’s spice mixture used in Louisiana for crab and shrimp boils, but the meatball stew TASTES like this might be a secret ingredient. The stew is spicy, warm-to-hot in intensity, has great middle-palate draw, and a surly smokiness, which lingers, giving one’s palate a rare glimpse of what Nirvana might taste like. IN SHORT: I LOVE THIS DISH. Upon leaving Café Rouge, I was told that this dish is on the menu for two weeks as a seasonal special. 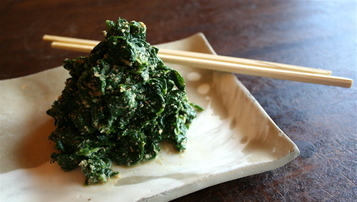 I implore the chef and his team to keep this dish on the menu for the entire corn- and collard-growing season. I simply cannot wait until next year to revisit this stew. PLEASE HIT THE COMMENT BUTTON, CHEF, AND TELL NAPAMAN.COM READERS THAT YOU’LL KEEP THIS EXCEPTIONAL DISH ON THE MENU FOR A FEW MORE WEEKS AT THE VERY LEAST! If this were a wine I were rating, I would give it 100 points. You can’t have a more flavorful, more perfect, more mouth-filling, pleasurable experience. Not in public anyway. Café Rouge. 1782 Fourth St., Berkeley. 510-525-1440. PS: Thanks to waiter Sean Arnold for answering to many of napaman’s seemingly pesky questions! 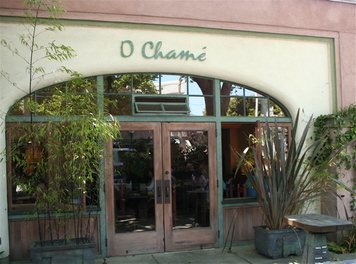 O Chamé – Worth a 100-Mile, Round-Trip Drive to Berkeley! O Chamé is a gem of a restaurant, a pearl, a treasure. In the pantheon of restaurants serving great tasting, original, delicate, perfectly balanced dishes, this tiny 45-seat-ery serves some of the best. Many times, we have driven from Napa Valley to Chez Panisse, in Berkeley, for dinner. We also love Eccolo, on 4th Street, in Berkeley. 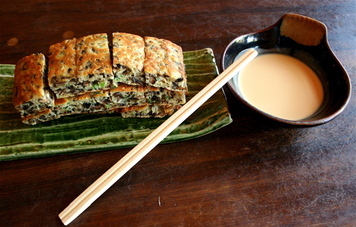 But THE place to have lunch, is O Chamé and THE dish to have is the original, awesome, unforgettable green onion pancake, which is so popular that it has never come off the menu in 17 years since chef-owner David Vardy opened. “It’s our bread-and-butter (money-making) appetizer,” says the bearded, camera-shy chef, who was trained as a medical anthropologist, spent time in Guatemala and then in Japan, cooking, where he met his wife to be, Hiromi. “O Chamé ” is the phonetic spelling of the Japanese symbol which means “precocious little girl,” explains Vardy. “Our daughter was 1-year-old at the time we opened, and we named the restaurant after her.” Of a fashion. Today, Vardy’s daughter, now 18, occasionally buses tables at the restaurant. The dish that drives me crazy – and for which I have driven 100 miles round-trip – is the seasonally changing Green Onion Pancake. At times, it is made with brown crimini mushrooms, at other times it is made with fresh corn kernels (my all-time favorite) or pumpkin puree. What comes to the table is a mound of three, pre-cut sheets of an omelet-like “cake,” though “cake” suggests something sweet, and this is anything but. The rectangular morsels resemble domino tiles and they are as much fun to eat as that game is to play. Today, this season, the crimini-green onion pancake sheets are golden on the top and bottom surfaces, and tiny threads of brown mushroom and green flecks of onion poke their tasty threads out the sides. There are only four ingredients in the concoction – it is minimalist, like the restaurant space itself. The four ingredients are: egg, flour, salt, beer. Then you flavor it with green onion, mushrooms, etc. Since day one, Vardy has served this savory egg confection with a dipping sauce made with homemade mayo, soy sauce and rice vinegar. It tastes a bit like a Thousand Island dressing – if you have to put a name to this salmon-colored, dipping sauce – but, in truth, it doesn’t taste like anything else you’ve ever had. It is perky, tweaky, silky; I can’t be more specific, or append the name of a fruit, or vegetable, I think it smells like, or of which it reminds me. The ingredients at O Chamé are not all organic, nor are they always all-natural, but they are always as locally produced as possible. Vardy makes his fish broth daily, using bonito flakes; his spinach, which is blanched in fish stock, and tossed with a tongue-clacking sesame, soy sauce, and rice vinegar dressing, is another reason to drive 100 round-trip miles. There’s nothing like it – or as simple and tasty – in all the high-falutin’ tourist-y San Francisco restaurants where entrees start at $40. On reflection, $6 will not buy you as much original pleasure at another restaurant in the Bay-area. At lunch, we usually split one of the over-sized bowls of udon noodle soups; the roasted pork tenderloin, spinach and takuan soup is sensational but so, too, is the aburage (tofu skins), shiitake mushroom and spinach soup. You can substitute soba (buckwheat) noodles for the udon (wheat) noodles, if you’re on a health kick. There’s a short but well-thought-out beer list. If you don’t know Red Tail from Mendocino, make this your beer of choice. There are also green teas, fermented teas and cold iced teas from which to choose a beverage. Much like The House (see my review elsewhere on this site) in San Francisco, this tiny oriental-inspired restaurant delivers pleasure way beyond the scale of its size, or the price of its fare. If one were to ascribe points, the way we do for wines, this restaurant is easily a 98-point eatery, like The House, and I can’t really tell you why it shouldn’t receive a 100-point Perfect Score, because in all the years I have been dining here, the food has been consistently good, the service pleasant and efficient. And the smile on my face, each time that I leave O Chamé, could have been the model for designing the Wal-Mart Happy Face – because a person just can’t have a bigger grin.